Gone are the days of calling a business out of the phone book or newspaper. People first grab their phones and look for your business online. A website is one of the first online places that a user will get an impression of your company. Think of it as your downtown storefront. Just like a physical storefront, you only have a few seconds or less to grab the attention of the passerby. On the web, you have even less time, and once someone “passes by” the odds of seeing them again are slim. We’ve been creating websites since 2009 and have had success with our customers. Read from any of our 82 customer reviews. 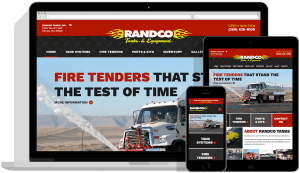 We’ve launched hundreds of websites over the years (view our portfolio) and learn something new with each one. Keep reading to get a good overview of our web design offering. 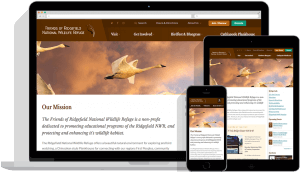 We design websites that not only look great but actually perform and attract visitors. Before we even touch the computer, we work with you to determine your goals (you need more sales, leads, exposure, etc.) so that we create a website that is in line with those goals. I hope you’re not looking for a cheap, basic website. If so, you’ve come to the wrong place. We create great beautiful websites that accomplish goals. Along with creating a website that fits your business goals, we focus on creating a website that is easy to use. We design websites that are intuitive and effortless to navigate. We build each and every website with search engines in mind. 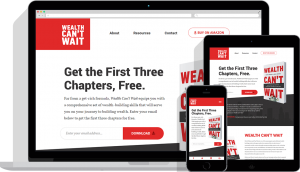 We build websites to search engine standards, so when your website goes live, it hits the ground running. We create websites that not only look great on a desktop computer but also a tablet and mobile phone. Why is this important? Google let us know way back in 2015 that people are searching more on mobile devices than desktop computers. 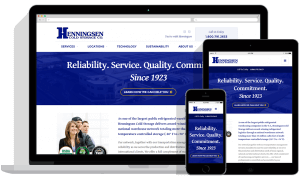 You want your visitors to have the best experience with your company online as possible, and we’ll make sure that happens with a responsive design. Depending on your needs, if you require the ability for you or your staff to manage your website, we can create your website with that functionality included. We customize a dashboard, making it easy to manage the content on your website. Forget the days of needing to call your web designer to add a sentence or fix a misspelling. We also create video tutorials that show you how to update your new website. Our customers love these tutorials. Not only are they able to refer to these videos for a refresher, they can also provide future employees access to them and they’re able to get up and running in no time. We setup and install Google Analytics and Google Webmaster Tools on all of our websites. These tools allow you to track how many visitors you have on your website, where they are from, their demographics, your most popular pages, and a whole lot more. From your domain name to hosting, we take care of it all.